Windows Mail is Vista's replacement for Outlook Express and comes free with Windows and is, probably, the first e-mail client application you will get to know. 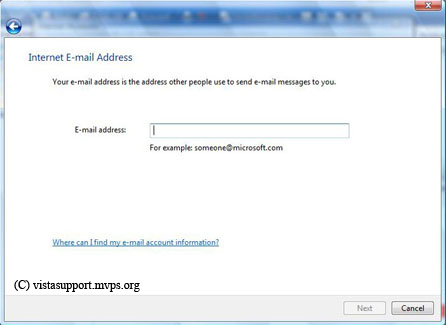 However, before you can use Windows Mail you need to add your email account details. Once this has been done you are ready to start collecting those e-mails. First Open Windows Mail by clicking on the Windows Mail option on the Start menu. Once the Windows Mail window appears look along the top toolbar and click on the Tools option. A drop down menu will now appear. From this click on the Accounts option. The Select Accounts type window will now appear (see screenshot 1 below). Click on the Email Account and then Press Next. 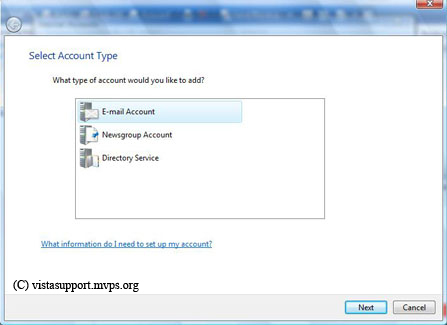 Once you have selected the Account Type and clicked the Next button the Your Name Window (Fig 2) appears. In the Display Name dialogue box type the name you want to use, for example Joe Bloggs. Once you have done that click the Next button. The Internet E-mail Address Window now opens (Fig 3). 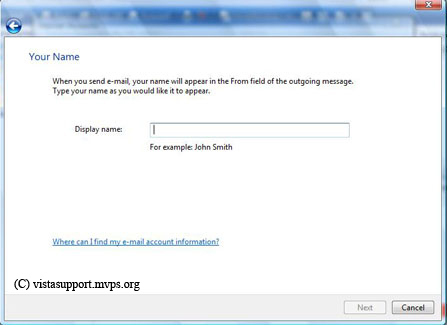 Type your e-mail address details into the E-mail Address dialogue box and then click Next. 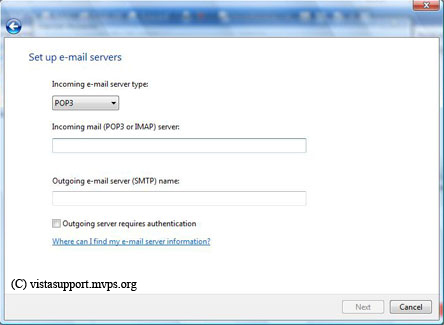 The next window to appear is the E-mail Server names Window (Fig 4). Incoming mail server: pop.virgin.net (replace virgin.net with your own ISP details (unless you are using Virgin). Outgoing mail server: smtp.virgin.net (again substitute virgin.net with your own ISP. Incoming mail server: mail.virgin.net (substitute your ISP name for that of virgin). Outgoing mail server: mail.virgin.net (substitute your ISP for that of virgin). Once you have filled in these details then click Next. 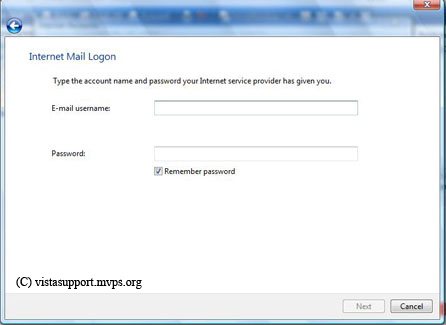 The next window to appear is the Internet mail Logon window (fig 5). Here you need to fill in the User Name you use to log on to your ISP. This can be either a name, i.e., joebloggs, or your e-mail address, i.e. joebloggs@virgin.net. The remember password option is ticked by default. This is best left alone. If you uncheck the remember password option you will be prompted to fill in the password every time you try to access your email account. After completing this section click the Next button. The final window to appear congratulates you on completing the details requested. All you need do now is click the Finish button and your email account is ready to use. 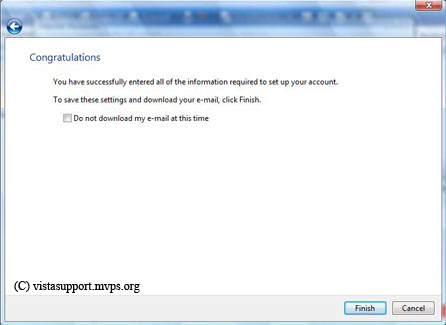 After you click Finish Windows Mail will access your email account and start downloading any available emails.